Giacomo Bianchi, MD, PhD, Anna Laganà, MD, Rafik Margaryan, MD, PhD, Marco Solinas. OBJECTIVE: elderly women undergoing aortic valve surgery are at high risk to develop patient-prosthesis mismatch (PPM) due to their small body size and cardiac structures. Recent introduction in the market of sutureless valves allows surgeons to implant larger prosthesis and overcome the inherent limitation of stented bioprostheses. This retrospective study compares the Perceval valve with stented bioprostheses in elderly women. 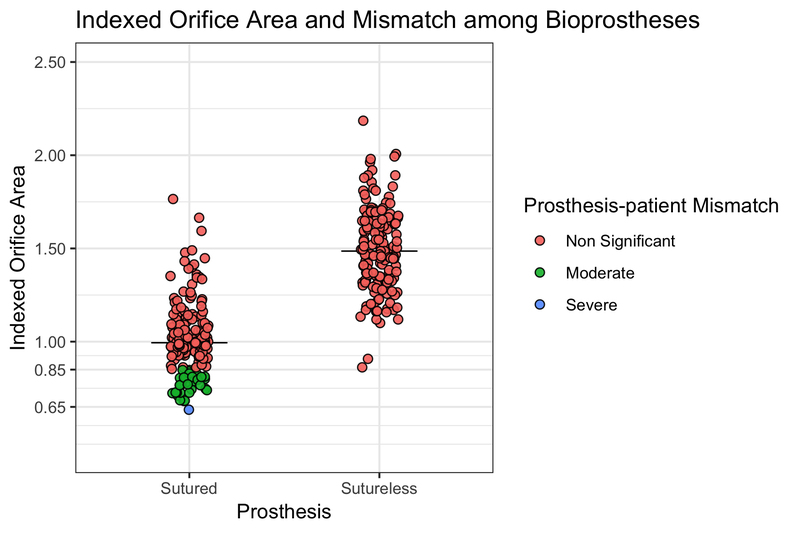 METHODS: from July 2001 to September 2017, 442 consecutive female patients received 280 sutured and 162 sutureless bioprostheses in the same center. Projected effective orifice area for each prosthesis was used to calculate the indexed effective orifice area (iEOA). PPM was defined according to published definition. To compare the two groups (sutureless vs stented) a propensity matching model (1:1 nearest neighbour at 5th digit) was used, yielding two comparable groups of 162 pairs. RESULTS: the indexed effective orifice area resulted 1.5 ± 0.2 cm2/m2 and 1 ± 0.2 cm2/m2 in SU-AVR and S-AVR, respectively (p <0.001). Moderate or severe mismatch occurred in 34 patients (21%) in S-AVR group, while no PPM was found in SU-AVR group. Intensive care unit stay, hospitalization, and major complications were not significantly different between groups. Left ventricular dysfunction (OR 7.46; 95% CI 1.32-37.4; p=0.02) and the presence of PPM (OR 7.19; 95% CI 1.53-33.7; p=0.012) were associated with 30-day mortality. At follow-up (6 years) only age (HR 1.1; 95% CI 1-1.2, p = 0.001) was associated with all-cause mortality. CONCLUSIONS: Sutureless prostheses prevent PPM and in patients in whom left ventricular dysfunction or the possibility of even moderate mismatch is present, should be considered as the surgical option along with right anterior mini-thoracotomy approach.